It's been a while since I've felt excited about eye liners. Mostly because they never seem to do what I need them to do. I usually find most liners are soft and don't last or stiff as a board and tear my eye apart while trying to apply. 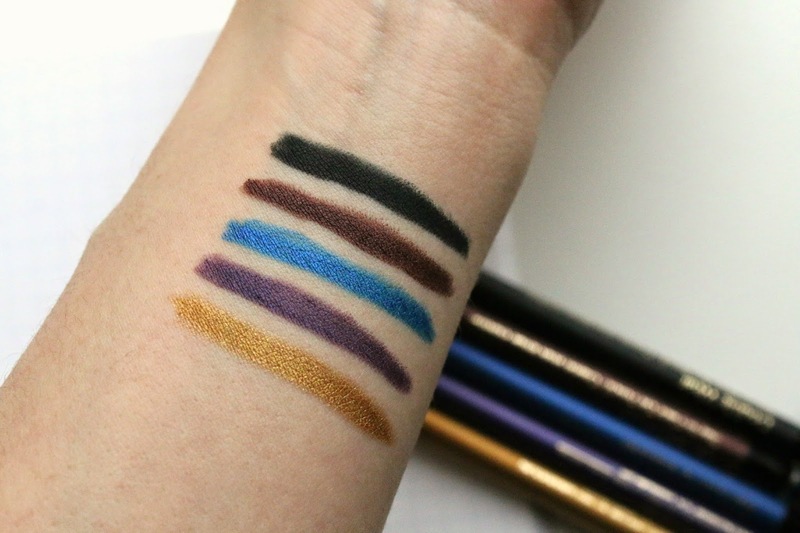 So you can imagine my surprise when I tried the (reformulated) Estee Lauder Double Wear Eye Pencils and actually liked them. Wore them. And found them to be worthy of a blog post. Upon first swipe, I was impressed. 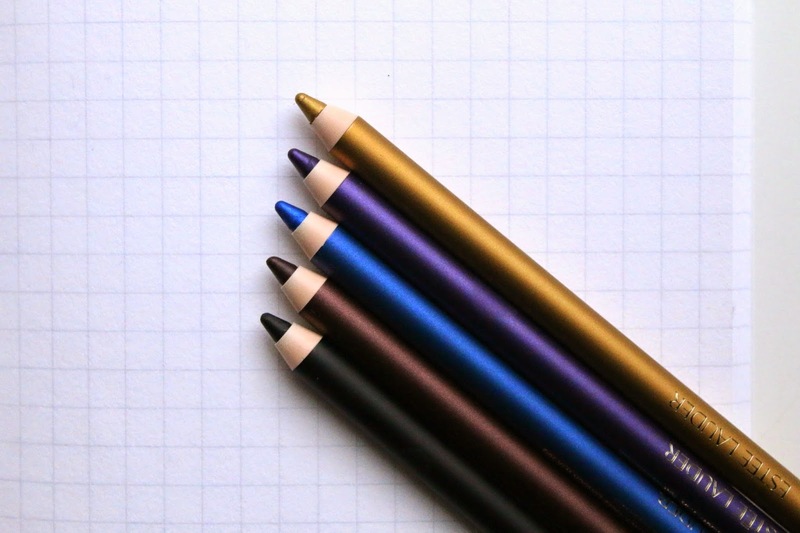 They almost look like a mechanical pencil (though they are not) and have a glorious gel-like texture that makes them glide right on. 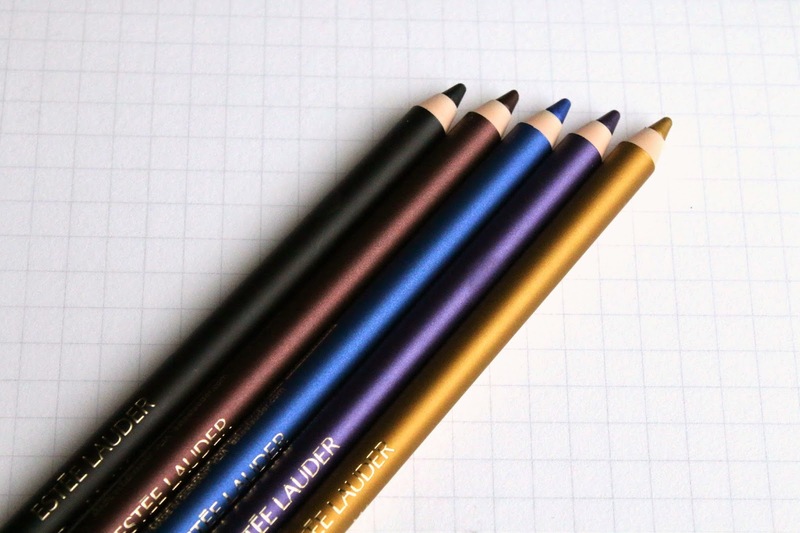 They feel and smudge like a true kohl pencil, blending easily and comfortably with the sponge tip at the end. But be warned, once these bad boys set, you can run a marathon through a rainforest and they will not move. I tried to use a make-up wipe to remove the swatches on my arm and nothing. Nada. They were still there as if nothing had happened. But don't worry, my trusty cleansing oil took them right off (currently I am loving this one) so there is a solution. Below are swatches of each shade that I tried. The shades listed from top to bottom are: Onyx, Burgundy Suede, Electric Cobalt, Night Violet and Gold. I wanted to grab Burgundy Suede and wear that one first, but I forced myself to start with a bolder color so I chose Night Violet. When worn super close to the lash line and coupled with inky black mascara, it's not as bold as I anticipated and looked quite natural. The sponge on the end is probably my favorite feature because it has such a unique angled shape that makes it perfect for creating a clean smudge and/or cat eye. I hate that dragging feeling that many liners give me and I didn't find that to be an issue at all with these. I like the idea of possibly adding a bit of color into my morning routine with the addition of an eye liner, rather than the commitment of a full eye shadow. 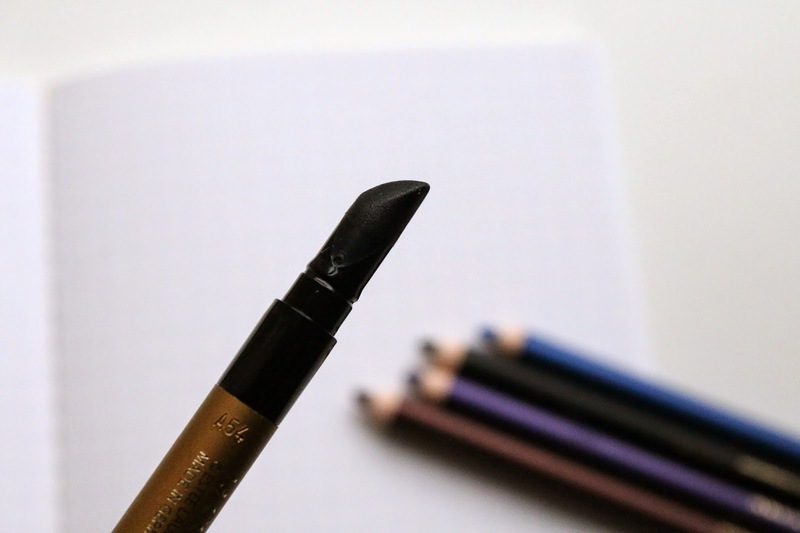 If you are in the market for a new eye liner and need it to go the distance while still leaving your lid in tact after applying, give these new Double Wear Pencils a go. And then drop me a line and let me know what you think! These look absolutely gorgeous! I love the shades too. I've been using the Estee Lauder Kohl Kajal lately and have been in love with it - it lasts on the waterline/tightline like no other!